There is not a lot of healthcare specific research about women and their healthcare opinions. That’s unfortunate since 80-90% of all healthcare decisions are made or influenced by women. Also some 2/3 of women feel that they are misunderstood by healthcare marketers. And two out of three healthcare dollars are spend by women. I thought it would be helpful to compile some great facts that can help guide marketers who realize the importance of marketing healthcare to women. 2. Healthcare is generational. Caregivers may be moms, daughters, wives or sisters. There is some thought that because women stay more connected to health providers because of childbearing, they stay more in tune with the importance of the regular checkups and take the responsibility for their family. For marketers, it is important to recognize the role of caregivers by speaking to them. Currently some 75% of baby boomers are involved in raising their grandchildren. And Millennial Moms are counting on their moms for help in making decisions. 3. Emotion in advertising reigns over rational thinking. We all know that most of typically buy with emotion and rationalize the purchase with facts. But in healthcare, there is so much that we can’t know. Recently I conducted focus groups with hospital users. The truth is that the only thing that hospital patients can actually measure is care, concern, responsiveness, respect, and outcome. They want to see authenticity in advertising – true stories, people like themselves. 4. Using the color pink is not marketing to women. So many times, the solution for making an ad targeted to women is to use women in the photography, use pink in some scripty logo and resort to cliche phrases. No doubt that Susan G. Komen has taken the color pink to a new level and now owns the color pink. 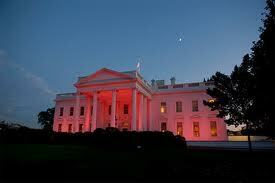 When you can get NFL players to wear pink cleats and get the White House to light up pink, you are on to something. But as the past few days have shown, a brand represents more than just a color. For marketers, pink is not a strategy, it’s a stereotype. There is a study that actually says that when we use the color pink connected to cancer, women know it is dedicated to them and subconsciously go into denial. The point here is that wrapping your product in pink and bling does not mean marketing success. Women want to be able to see themselves or their need expressed in the advertising. 5. Families are not nuclear anymore. Today, 41% of all births today are to unwed mothers. We are finding that today’s family is not the typical two parents and two children anymore. More women are the head of household. A 2010 Pew Research survey found that 52% of Millennials say being a good parent is “one of the most important things” in life. Just 30% say the same about having a successful marriage — meaning there is a 22-percentage-point gap in the way Millennials value parenthood over marriage. If you are marketing healthcare to women, don’t rely on traditional family photos, and don’t forget the importance of diversity. 6. Smartphones rule. If you haven’t noticed, smartphones now comprise one out of every three phones. And with this easy access, 16.9 million access health information through mobile devices. Some 17% used their phones look up health or medical news. That number marks a 125 percent growth rate over the same three month period in the previous year. The research firm comScore found that about 3 in 5 or 60 percent of the mobile health information seekers were under the age of 35. 7. Social media is Word of Mouth! A recent study from Lucid Marketing and HeardItFromAMom.com confirmed how women share health information. The report finds that technology that connects friends is a top choice for moms seeking health-related information. The research shows that 84 percent of Moms often share health related information via email and 69 percent often share via Facebook. Email and Facebook are also the places where they most often hear recent news – email (83 percent) and Facebook (76 percent). And here is the most important stat – 63% of Moms believe word-of-mouth received from other moms and 56% are likely to pass it along. 8. Peer to peer recommendations have more weight than national awards. Yes, awards can be important but given a choice between Healthgrades and your best friend, women will choose the best friend’s advice. In fact, they may prefer any peer recommendation more. Holly Buchanan, coauthor of The Soccer Mom Myth – Today’s Female Consumer: Who She Really Is, Why She Really Buys, notes that women tend to have a “longer checklist” of important factors when shopping, which explains why Web sites with a healthy selection of reviews fare better among women shoppers. “The copy in the review is talking about things further down the checklist that the actual product review does not cover,” Buchanan points out. A preference for peer-to-peer recommendations on products and purchasing goes beyond the company Web site for many women consumers. A BlogHer study also determined that 35 percent of women trust a product review from a blogger more than a user-generated review on a company Web site. Falling shortly behind was a status update from a friend via social media. According to Quandcast, about 23 million American women are weekly readers of or contributors to blogs, while 16.8 million maintain a consistent presence on message boards and forums. 9. All research starts online. Women go online first to gather information. In every healthcare study I conduct, I find out the number of women online researching is growing. We don’t seem to buy anything without gathering information first. So for marketers, that means that your brand presence and the content you provide is crucial. And they compare your website with the all-star sites like Mayo Clinic, WebMD and Cleveland Clinic. Keeping your website up-to-date and informative is crucial. Also having a presence on social media is important. And having a regular flow of publicity is crucial. 10. Digital advertising is very important because women are online. Digital advertising is still not included on many healthcare campaigns. I know, it’s incredible, isn’t it? When your target is online 24/7, you have to have a presence in search engines and in online advertising. Women are actually more engaged online than men are. And those digital ads should lead you to important information, videos, instruction and more valuable content. Thanks for contributing to the women’s health care conversation! Advertising health care to women is tricky as stereotypes about women as so pervasive in our culture and most women seeking services today are over 50 and portrayed inaccurately. The on-line social world is where women are sharing information, much more than men are around health and wellbeing, according to Pew Internet Research. As Pew indicates, it’s in the sharing of information and real stories that are changing health and healthcare for women today and empowering them to be their own best health and wellness advocates. Marketers must shift their strategies to include marketing WITH women, instead of targeting them with one-way messages both for credibility and trust – both are lacking in the pharma and insurance segments of healthcare. Thanks Kelley. I couldn’t agree more. Women are effective and authentic storytellers, and we need them in the conversation. Check out MyGrowthCharts.com, a fantastic new site that allows women to chart their weight as well as their children’s ht./wt. and head circumference. They have charts from WHO, CDC, and 16 genetic conditions and it is free for families. You can share your charts with your pediatrician. Great blog! trendwatching.com’s 2012 trend of “Maturialism” is a fantastic opportunity for healthcare marketers building relationships with women. With the state of the world and economic environment, women don’t have time for brands that talk down to them, and expect frank, honest conversations: mature vs. material. I hope more healthcare brands embrace the shift from surface, “materialism” in communications and lean more on mature dialogue. Healthcare can be a scary topic for many, especially if it’s in relation to a cancer diagnosis or another disease state. Yet, women (and men, of course) deserve and are asking for straight talk. Because so many healthcare brands fail to engage, audiences go to social circles for conversation — there’s nothing wrong with this, of course. But, audiences can miss out on professional, medical opinions and information that has been vetted and proven true. run the analysis of your on-line competitors’ keywords. without in the today’s world. You are currently reading Marketing Healthcare to Women: Ten Things You Need to Know at The Lipstick Economy.